I know little of South Carolina's Noxious, recently under the wing of England's TSM Promotions, but I think their fans are going to love their latest disc 'Timbre.' Noxious is, generally speaking, a post-grunge modern American hard rock band having roots in and similarities to Alice In Chains, Soundgarden and others about a decade ago. Whether post or not that whole era wore irritated me like a mouth sore constantly rubbing against an eye tooth. Therefore, for me, not many bands are able to bring anything new to the table. However, Noxious is marked by tempered and disciplined musicians who know how to breath life into this urbane genre by working outside their comfort zone. 'Timbre' is a ten song disc where six songs are reworkings of old material with a more front porch, down home, acoustic driven sound, and four our new songs, following this same direction. Lacking both familiarity with their back catalog and sufficient promotional notes, I can only tell you that 'Broken' and 'Fish Bowl' have are previously released, currently rearranged and adequately accomplish Noxious' goals for this work. Of the four new songs, again lacking sufficient information, 'What Lies Ahead' and 'Long Hard Road' are identified. Of these, the latter is quite brilliant having a genuine southern styled arrangement and rich vocal harmonies which sound as if Simon & Garfunkful went south also. As for the rest of the album, whether old or new songs, two songs compete for best of the bunch. First, 'Fresh Veins' is the tremendous and efficiently compact blues song featuring some terrific harmonica and old school organ work. 'All You Know' finds Noxious punching out the sides of their creative box by blending horns with a funky arrangement. These two songs and the aforementioned 'Long Hard Road' are quite remarkable highlights. However, throughout my listen I was generally unmoved; I wasn't bored, just ambivalent. Chalk this up to my presuppositions about the genre. Alternatively as I said before, fans of the band will undoubtedly find 'Timbre' to be both intriguing and entertaining. 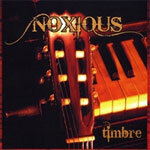 'Fresh Veins,' All You Know, and 'Long Hard Road' are quite remarkable highlights on Noxious' 'Timbre'. However, throughout my listen I was generally unmoved; I wasn't bored, just ambivalent. Chalk this up to my presuppositions about the whole post-grunge modern genre. Alternatively, fans of the band will undoubtedly find 'Timbre' to be both intriguing and entertaining.